Every ten years, the Commonwealth of Pennsylvania redraws electoral boundaries after results of the decennial census are tabulated. Will this be done in a way that is transparent, impartial, and fair to the voters? Or will we continue to see gerrymandered districts that preserve safe seats for legislators? You can read updates written by Mary Erdman and Terry Schettini, members of our League and member, FDPA Speakers Bureau, in issues of The Voter newsletter posted on Newsletters=>Membership. 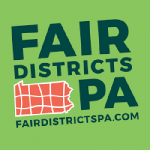 You can keep up with events put on by or supported by Fair Districts PA on their website. Today Governor Wolf released an executive order creating a Pennsylvania Redistricting Reform Commission, to examine best practices, invite public input and make recommendations for a non-partisan redistricting reform process. You can read the press announcement here. Two leaders from within our Fair Districts PA coalition will be part of the commission. David Thornburgh, Executive Director of the Committee of Seventy, has been appointed as chairman. Susan Carty, President of the League of Women Voters of Pennsylvania, will also serve on the commission, along with academics, past elected officials, four current legislators and Amanda Holt, who led a successful lawsuit challenging the 2011 legislative district map. We welcome the opportunity to offer comment and attend commission meetings on this important issue. Our coalition of good-government organizations and thousands of citizen advocates will provide whatever help we can to end the conflict of interest that allows party leaders to draw district lines designed to maintain their power and protect incumbents. We’ll be encouraging Fair Districts PA supporters to attend the six open meetings to be held across the state and to submit comments online in support of an independent citizens commission. As the order says, “the success of our democracy demands fair, equitable elections.” Fair districts, drawn through a fair, transparent process, are foundational to representative democracy and essential to restoring confidence in our electoral system. Fair Districts PA commends Governor Wolf for this important step forward in the fight to end gerrymandering. This new commission will be a valuable addition to the work toward redistricting reform and a chance to broaden the conversation with legislators and the public. Thank you for YOUR part in making clear that Pennsylvania residents want an end to partisan gerrymandering. And thank you for your continuing role in this important conversation. PS: We’ll be continuing our own part in this conversation. We have about 215 volunteers, advocates, current and past legislators, redistricting experts and members of the press registered for our Reclaiming Our Democracy Town Hall this Saturday. We’ll be providing lunch and there’s plenty of free parking nearby. It’s not too late to register. And if you can’t join us, look for the live stream on our state Facebook page or watch for sessions to be posted on our Fair Districts PA Youtube channel.